Pink has sent her fans into meltdown by revealing that she’s VERY pregnant. The 37-year-old looks radiantly beautiful as she poses alongside Willow in the gorgeous photo. Dressed in a flowing white dress, but maintaining her signature style with a black top hat, Pink, whose real name is Alecia Beth Moore, holds on to her growing belly. Little Willow looks beautiful in a matching dress as she clings to her mum’s arm. Her fans jumped at the chance to congratulate her, whilst simultaneously expressing their shock at the news. 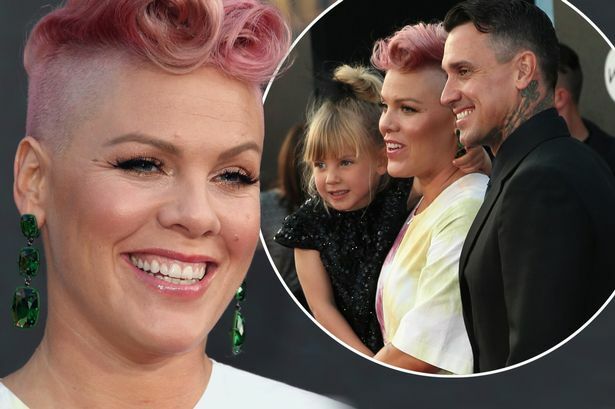 It is obvious that even Pink’s biggest fans had no idea that she was expecting her second child. Pink first met her professional motocross racer husband at the 2001 X Games in Philadelphia. She proposed to him in 2005 by writing, “Will you marry me? I’m serious!” on a pit board during one of his races. He initially drove past the sign without noticing it, but pulled over to accept her proposal the second he did. They married in 2006 but separated in 2008, after which he famously appeared in the music video for her break up song So What. They got back together in 2010 and their daughter, Willow, was born in June the following year.